Norwalk, Conn. – Perry Fina was born in New York City in April 1892 of immigrant Italian parents; he was taught to speak fluent Italian at home and showing an early mechanical aptitude, he returned to Italy with his mother and younger brother Fil in 1902. 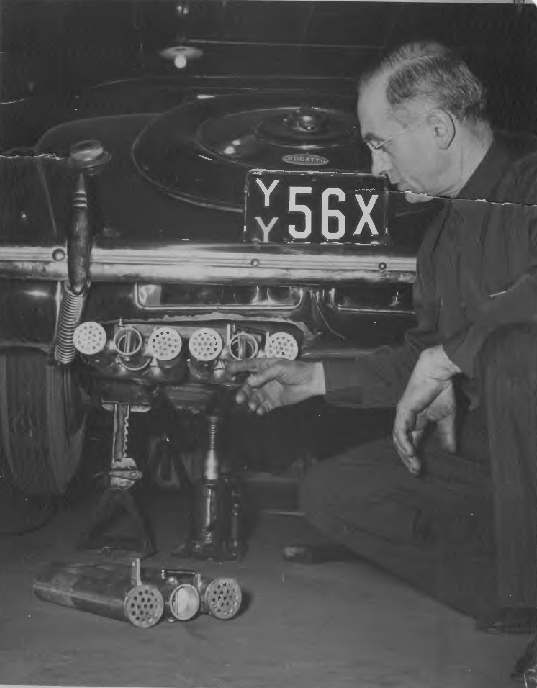 In Italy he began a nine year apprenticeship in the automotive industry initially with Fiat Motor Company and later Isotta Fraschini, receiving his master mechanics degree. 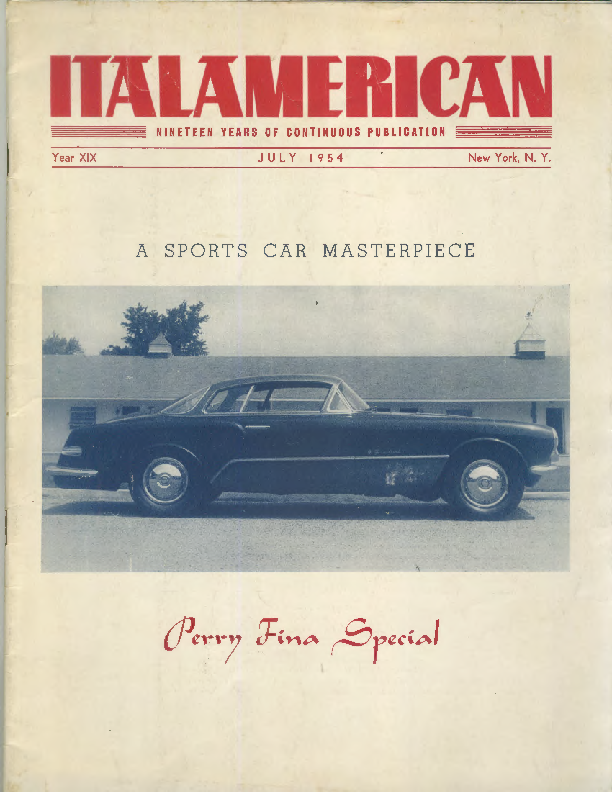 After extensive travel around America, Perry settled in Saratoga, NY and opened a foreign car service center with his brother Fil, who had also apprenticed in Italy. The garage became very successful specializing in foreign built cars. Along the way, Perry married his wife Lillian Kane, bringing up four children, his son Joe and three daughters. 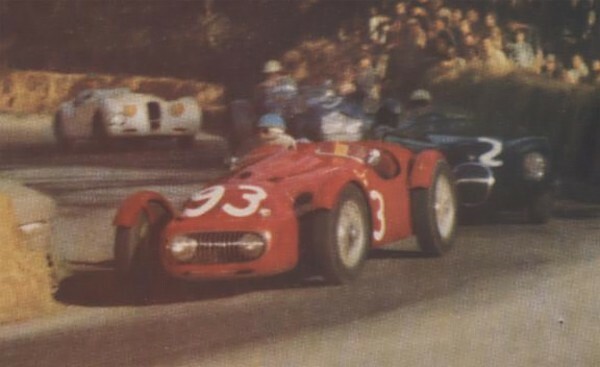 Joe also showed his father’s aptitude around machinery and automobiles and started work in the business at a young age. In 1928, following the sudden loss of his father, Perry decided to move back to New York City, leaving the Saratoga business to his brother. After several starts and stops, he opened a garage on West 54th St. and gained a reputation with wealthy owners of foreign cars for quality service. His customers in the day included celebrities Dave Garroway, Jackie Cooper, Skitch Henderson and Paul Whiteman, all owners of exotic sports cars. A Perry Fina prepared Allard J2 is in the Simeone Museum collection in Philadelphia. Allard register data on this car reads “Car was ordered with left hand drive by Perry Fina of New York. Engine installed by Bill Frick. Engine includes special manifolding and carburetors. Perry Fina nameplate is on firewall. The engine mounts to hold Cadillac motor. 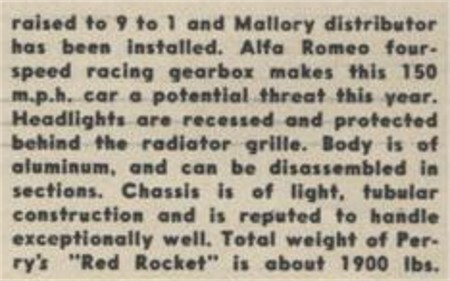 Shortly after it arrived to Perry Fina’s shop for his work, Bill Frick installed the 1951 engine. 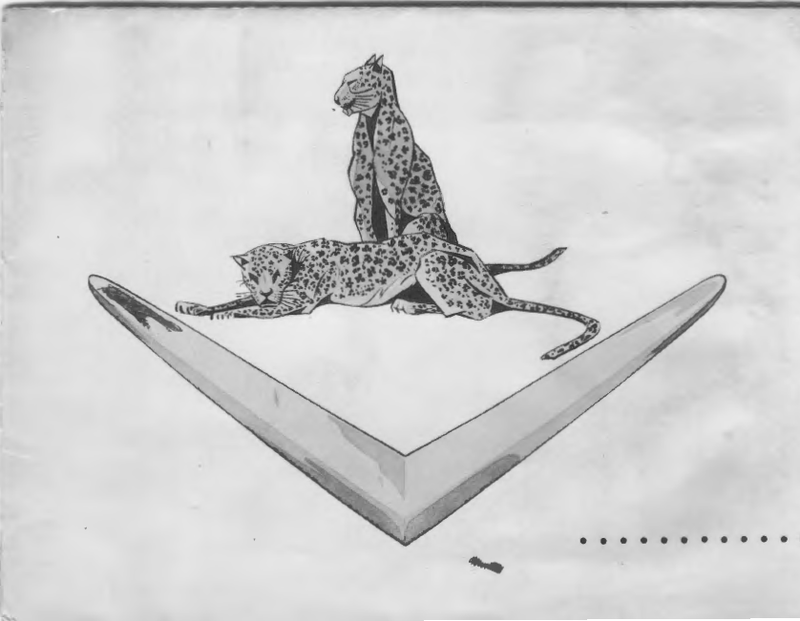 These gentlemen represented the most experienced Allard assemblers in America at the time”. 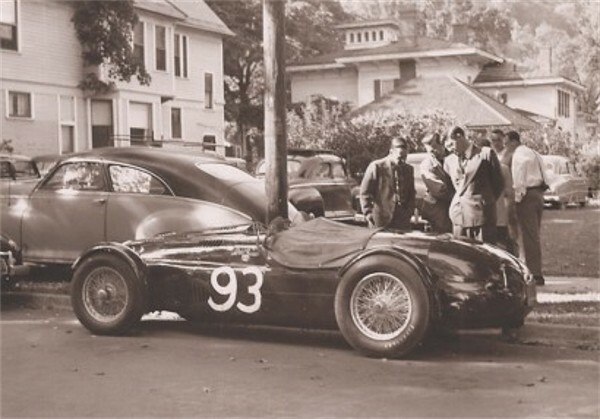 In addition to building, servicing and racing automobiles, Perry Fina designed and fabricated customized parts for his customers including special inlet manifolds to convert engines to dual and quad carburetion as well unique cast aluminum mufflers. Automotive writer Karl Ludvigsen campaigned a 1949 MG-TC in the early ’50s with a Fina designed muffler system. Ludvigsen wrote in the day “From Perry Fina in New York, I obtained and installed one of his special cast aluminum silencers. The normal silencer was removed and a straight pipe fitted to almost the rear of the chassis. There sat the Fina silencer shaped like three tines of a fork. The outer two tines had perforated caps holding in steel wool packing that did the silencing. In the center tine was a butterfly valve worked by a T-handle on the floor. With a pull of the handle the exhaust went straight through. The TC’s race preparation was simple. I just pulled the T-handle and presto! I had straight open exhaust”. 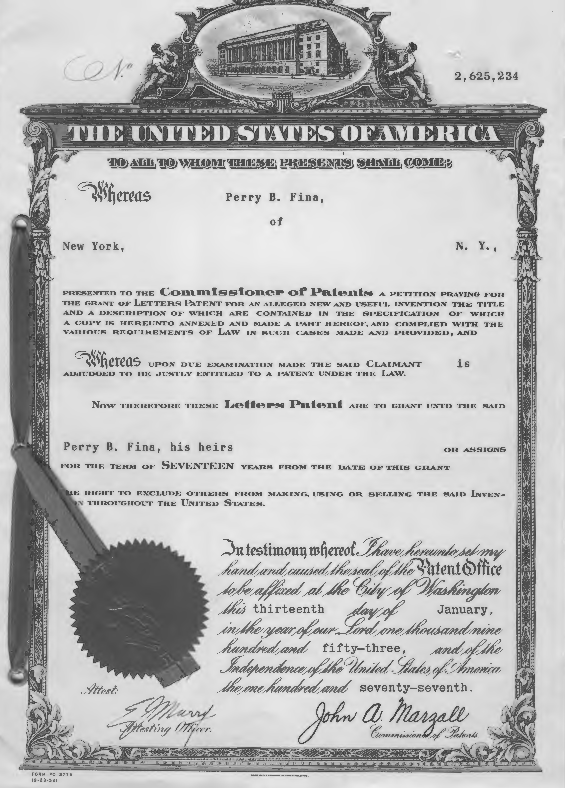 In 1953, Perry Fina was granted a U.S. Patent for what was termed a “Valve Controlled Muffler with a Plurality of Through Passages”.